If you love peacocks like I love peacocks… and then there’s something like Oh, what a gal! and some other stuff. I know the tune and I know about a dozen words, and the rest of the song is filled with something, something, something. I’m pretty sure the song is about a gal named Susie. And I’m pretty sure it has nothing to do with peacocks. But I do love peacocks, and it fits the tune of the song, so why not? 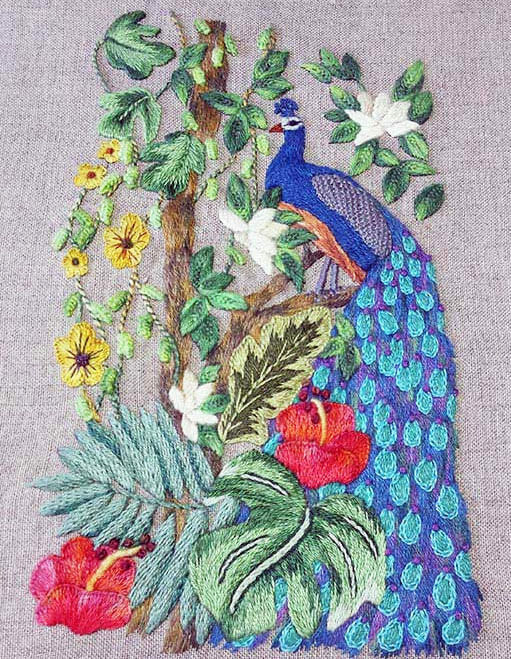 I especially love peacocks in embroidery. They are a Prime Target for the embroiderer. They beg to be rendered in thread, with their glorious colors and fabulous plumage. So, needless to say, when Canevas Folies came out with Blue Peacock, I was twitterpated. Let me show you the kit, so you can be twitterpated, too. Luscious, to say the least! 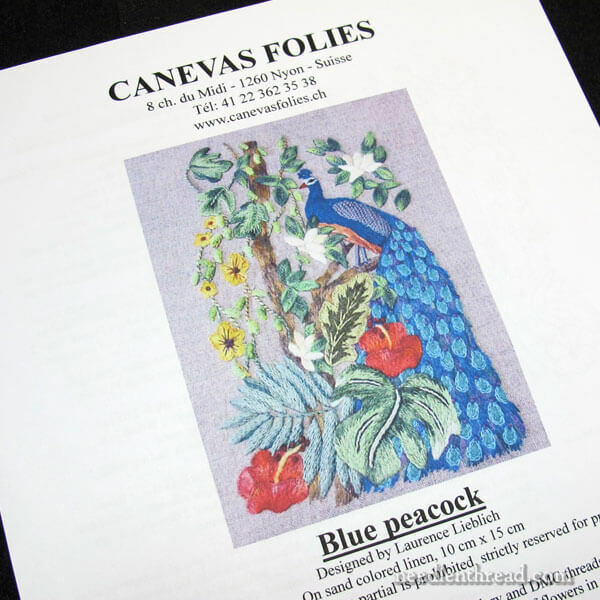 Canevas Folies is a Swiss embroidery company, and they make gorgeous, exuberant – yet small and manageable – designs and kits for hand embroidery. This is one of their latest. Blue Peacock is only 4 x 6″, so it’s not a huge embroidery project. This (in my mind) makes it doubly desirable. Because of its size, you know it’s a project that you can reasonably finish in a reasonable amount of time! 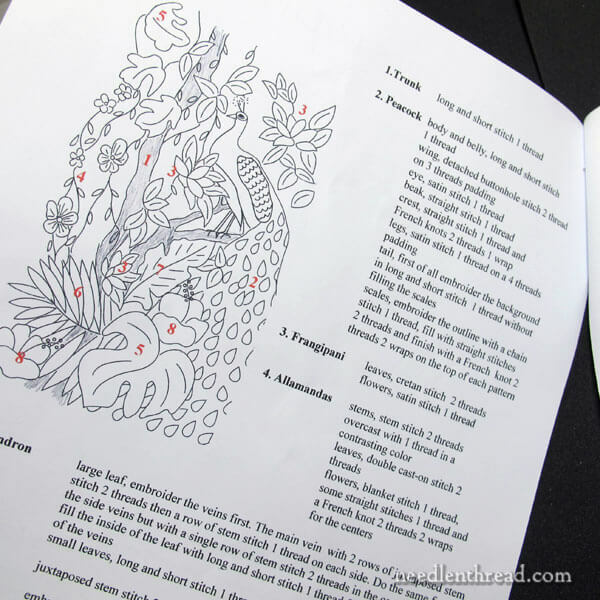 …and very basic instructions which include a color guide and stitch layout. There’s not much in the way of stitch instructions, with the exception of diagrams for two stitches. The kit assumes you know some embroidery. The stitches in the piece include stem stitch, chain stitch, French knot, blanket stitch, backstitch, straight stitch, bullion knots, satin stitch, cretan stitch, long & short stitch, detached buttonhole, and double cast-on stitch. 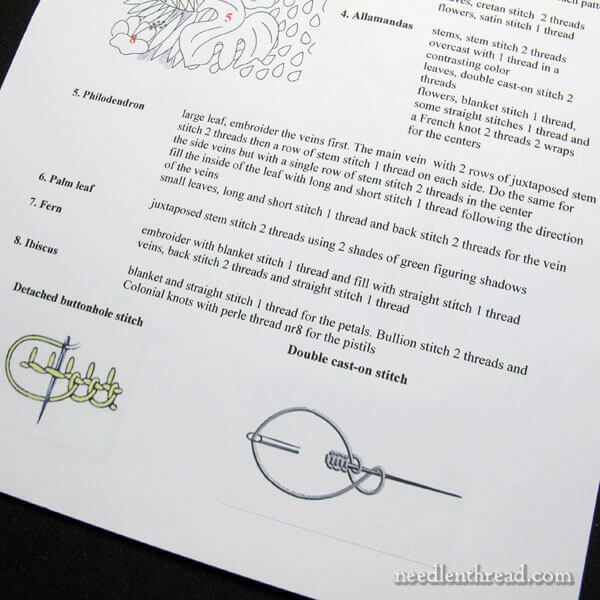 You can find step-by-step or video instruction for all of them right here on Needle ‘n Thread, or in any good stitch dictionary. The kit also comes with the House of Embroidery specialty threads that are used in the design. A few DMC colors are used as well, and they’re listed in the instructions. You can pick those up locally. I think it would be challenging for beginners – I’d recommend it more for intermediate embroiderers. It has a nice variety of stitches, it makes use of a fantastic color scheme, and it’s small enough to finish it in a short time and have fun the whole while! So, if you love peacocks like I love peacocks, look it up! In the US, you can find Blue Peacock through The French Needle. In Europe, you can find it directly through Canevas Folies in Switzerland. I really want to work this kit. I should have been an octopus. March 22, 2013 Pretty Surface Embroidery Kits – Perfect for Learning! I have enjoyed looking at these kits for years. Maybe it’s time I purchased one. I completely agree with the octopus thing. Also, 48 hours in every day would be helpful. What a beautiful little kit. I love, love peacocks too. LOL, an octopus… My mom used to say there needed to be 3 of me to get everything I wanted/tried to do done! And I agree with Carol S., more hours in the day would sure help, not that I don’t try to extend the days… I get very little sleep. Hahaha! It looks like the US kit is sold out. Does anyone know another source for it in the US? It’s gorgeous! I’m sure they’ll get it back in at French Needle. I don’t know of another source in the US for Canevas Folies designs. I just added some more to the site ! Thanks, Mary! In that case, I’ll check back. Beautiful! My sister loves peacocks even more than I do. When I get back to work (on medical leave for a couple more weeks) I’ll be ordering this kit & she’ll get the finished product! She has lured me into the quilting world and treated me to TWO quilt retreats this year! She deserves a surprise. That sounds very nice, Cynthia! She’ll love it! I hope your medical leave isn’t too serious, and that you’re able to relax and recover! Thank you for this – I really did smile a lot! I think the song is”If you knewSusie like I know Susie”….but then I think you knew this all along, your interpretation is so charming. I usually avoid kits, but this really does sound super. Thank you again for all your truly thought provoking and inspiring comment ts. M.
Gorgeous. And, ah, to be located in Nyon! A stunningly gorgeous town on the Swiss Riviera along lake Geneva. What a fairytale perfect place for gorgeous embroidery! Missed yesterdays post as I was dog sitting for my sister. Anyway the tune is “If you knew Susie like I knew Susie Oh, Oh, Oh, what a gal” etc. My parents used to have the record many moons ago, showing my age. The Canevas Folie Blue Peacock kit is lovely bright, colourful design and has a good variety of stitches and you could definitely lose yourself in this design with all the variety of stitches and colours and as you say very Luscious. Thanks for sharing this lovely design with us very cheerful design for the beginning of the weekend, I hope you have a great one. 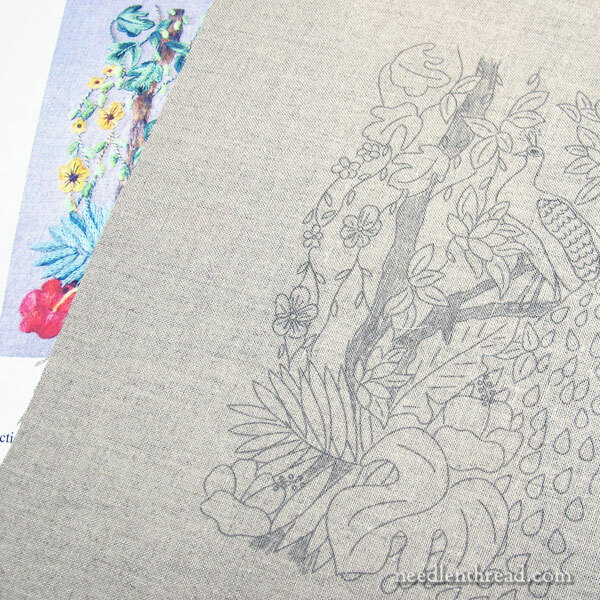 I’m an admirer of the Canevas Folies kits as well, though as a beginner at embroidery, I haven’t tried them yet (I’m still learning the basic stitches!). Are there any Canevas Folies kits you’d recommend for a beginner like me? They’re so pretty! Thanks, Jana! I enjoyed reading that! This kit is stunning! I never buy kits! I am so tempted…. Now I have ‘S-U-S-I-E Susie’ from ‘Anchors Aweigh’ going through my head….. I can very non-specifically say that the design has lots of little flowers, and it’s working up very nicely. 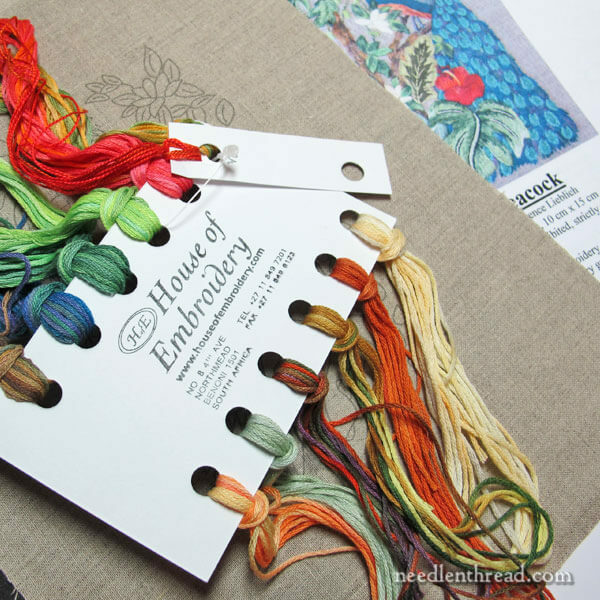 The specialty threads are none I’ve heard of before, but they’re gorgeous! I’m not really a “kit” person, but this one has changed my mind; I’m planning to order a couple more (the two I want are currently out of stock, so must wait…). I have worked with all of their threads – they are wonderful to work with and beautiful. Just remember, you can’t die until you finish all your UFO’s. I will probably live forever. My favorite stitch is the lazy daisy, which can also open up to a fly stitch. It is great for leaves, feathers, flowers, beards and just about anything you want to apply it to, depending on whether you want to use it upside down, right side up, in a chain, or all by itself! When I saw your title on my e-mail, I started humming that tune–the day before I had a chance to open the post and read it–so it was a funny surprise! It must be something about rhythm & certain words, I can’t explain since I’m not a musician or poet. The refrain is all I know of the song, but now I know it can become a major ear worm! I have named the Peacock Susie.. I know just what you mean by “so many projects, so little time”. Is there any “cure” for us? I hope not!! This one is worth making time for. You have so topped yourself!! So congratulations for a job well done. Thank you, you inspire me! It’s so nice and dense, just the sort of thing I wish I had the time to do. I can’t wait to see you do it so I can enjoy vicariously. Here’s an early version of “If you knew Susie” in case you want to hear the usual lyrics. Next Next post: The Peacock Kit – A Give-Away!